It definitely looks like a weekend for staying indoors. The Scandinavian Film Festival starts, Australia’s Women’s Volley Ball team is in action at the AIS, the Old Canberra Inn is putting on a mid-winter folk festival this Sunday afternoon, and the National Galley has opened a new exhibition featuring the work of Albert Namatjira. Don’t forget, Constellations continues at The Street Theatre, and for this weekend only Mr Stink is showing at the Canberra Theatre. And for the taste of winter, there is a Truffle Market Day at Westfield Woden on Saturday. The National Gallery’s latest exhibition puts on display for the first time, the Gallery’s collection of watercolours by Albert Namatjira – ‘Painting Country’. From the traditional Country of Western Arrarnta, Namatjira was the first Aboriginal artist to be recognised for painting landscapes in the western tradition. 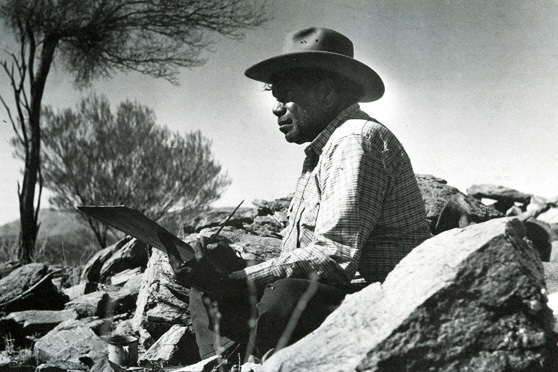 Namatjira was born and raised at the Hermannsburg Mission, outside of Alice Springs, and learnt about watercolour painting from visiting European artists in 1939. He went onto to prolifically paint the desert landscape of his traditional country and teach watercolour painting to his children and other people at Hermannsburg Mission. The Gallery’s collection of Namatjira’s paintings were generously gifted to the Gallery by philanthropists Gordon and Marilyn Darling, who collected them over thirty years and are being displayed alongside paintings by artists Namtijira inspired. Last weekend it was Australia’s Men’s Volley Ball team who was vying for a place in the 2018 World Championships, this weekend it is the Australian Women’s Volley Ball team who are competing in the Fédération Internationale de Volleyball (FIVB) Grand Prix Group 3 Finals. The teams in this Group were Australia, Cameroon, Trinidad and Tobago, Mexico, Hungary, France, Algeria and Venezuela. And of these teams Australia, Venezulea, France and Hungary are left to play out the semi-finals and finals. The semi finals will be played on Saturday at 4 pm & 7 pm, the Bronze Final will be played on Sunday at 1 pm, and the Grand Final will follow at 4 pm. Get tickets here. Relive the 90s with some classic Australian rock from the Hoodoo Gurus and You Am I. Both of these bands are known for putting on great shows so together they should deliver something special. Tickets from $59, book here. CDP Theatre Producers is bringing another great kid’s book to the stage, David Williams’ Mr Stink. The show tells the story of Chloe and a local tramp, Mr Stink. Chloe is lonely and needs a friend, Mr Stink needs a place to stay. Chloe likes Mr Stink because he is nice to her, so she invites him to stay in her garden shed. Of course, not all is as it seems. Tickets are $24 and can be booked here. The Truffle Festival continues this weekend with a Truffle Market Day at Westfield Woden. There will be cooking demonstrations from local chefs, wine tastings, market stalls, food sampling and kids activities including cupcake decorating, face painting and balloon bending. The Old Canberra Inn is putting on an afternoon of great music, poetry and entertainment this Sunday, so settle in with a beer or red wine in front of the fire and enjoy. Guyy and the Fox will be playing along with Evan Buckly, from The Burley Griffin and Chad Croker. Poets include Betty Slim, Andrew Galan, Chris McGinty and Georgina Vallance. And Chris Endrey will be hosting the event. An easy Sunday afternoon. If you’re looking for live music around Canberra check out The RiotACT Gig Guide (19 – 25 July).